At Mazda Swag, we believe in offering you the absolute best selection and quality for your vehicle. Mazda is well known for making affordable and highly reliable vehicles, and it only makes sense to buy replacement parts manufactured by Mazda and not a third party aftermarket manufacturer. Mazda OEM - or original equipment manufacturer - parts are designed and created by the same engineers and plants that developed your parts in the first place, so you're removing any variability you may have from the process when you pick OEM parts from Mazda Swag. We're looking forward to helping your car run well again - you'll notice the difference right away when you replace your old and worn out brake pads with new OEM Mazda brake pads. 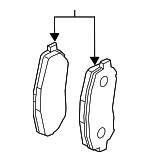 Feel free to contact us — we are happy to answer any questions you may have to help you better understand the difference between aftermarket brake pads and their varying levels of quality and those brake pads offered by the designers at Mazda themselves. Mazda Swag isn't just an online parts store — we are an actual dealership in Peoria, IL called Scherer Mazda. Let's make your car run like new again with the highest quality Genuine Mazda brake pads available!